Translation is a bilingual process which frees us from our basic monolingual insularity. 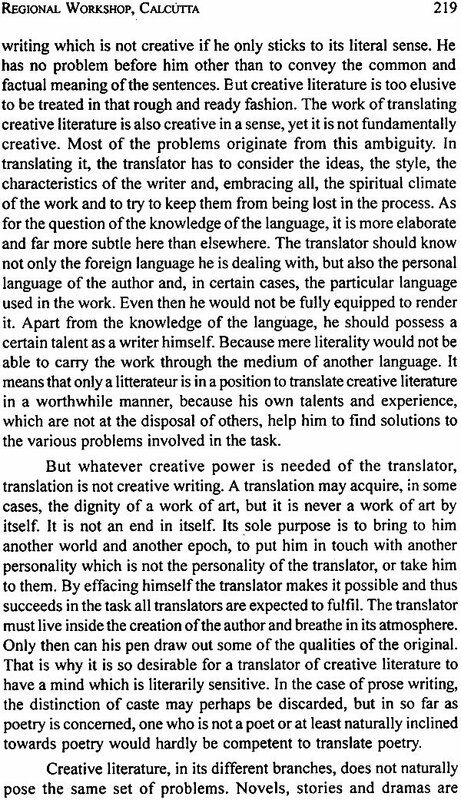 Among all kinds of translation, the literary one is probably the most challenging because here the translator is to transfer the inner turmoil as well as the core of the silence of the writer from one language into another. Nevertheless, it is probably the only process by which a multi-lingual nation like India can be emotionally integrated. 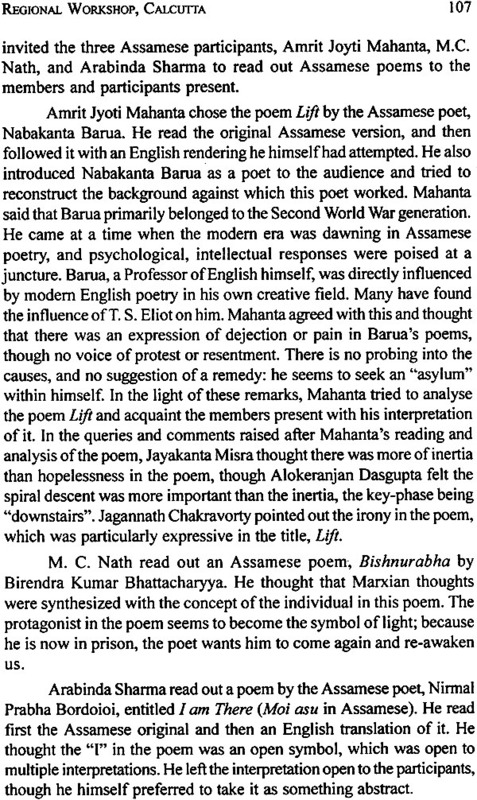 Thus literary translation has a tremendous potentiality to develop into a major discipline, especially in India. This is a cumulative report of four workshops on literary translation organised by the Sahitya Akademi. 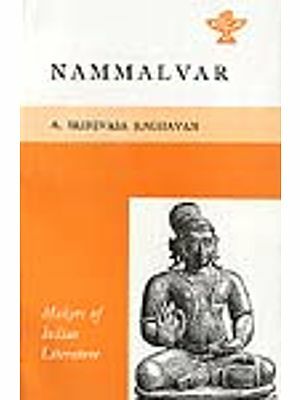 Apart from factual accounts of the programmes and proceedings, it contains the texts of select lectures delivered by visiting experts on various aspects of the translation of literature, historical surveys of translated literature in a few languages, discussions of the theoretical and practical problems of translation, views of eminent creative writers and resolutions and recommendations proposed by practising translators from' all parts of India. K. Ayyappa Panlker (1930-2006), the editor of this consolidated report, was an erudite scholar, critic and aesthetician, apart from being a leading poet in Malayalam. "It has been amply proved that a language grows by its intrinsic strength and not by Government order. Government support may make it grow a little but it does not grow in the real sense. It grows only when it has life. Our languages have that vitality. They are progressing. But if we take a wrong path and Insulate Hindi and other languages from each other, they will wither and lose their sparK of life. If we want our languages to be strong and to be fresh, they will have to open their doors and windows not only to one another but to the languages of the whole world in order that they may gain from the contacts. This will keep our languages• as well as our country afresh." 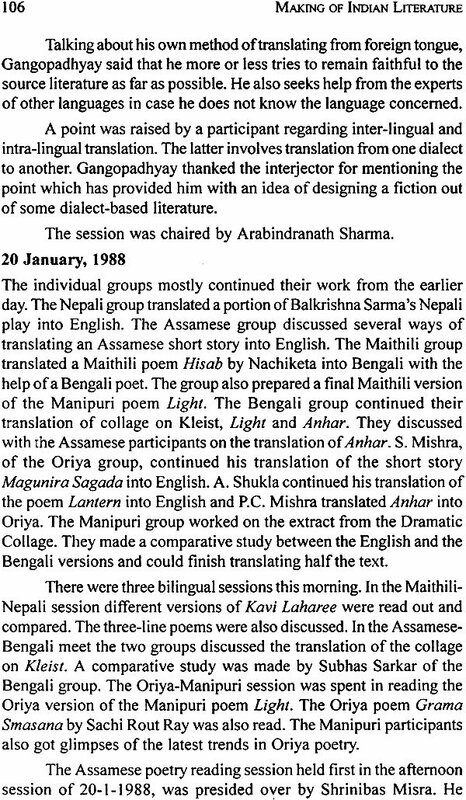 This cumulative report of the four workshops on Literary Translation organised by the Sahitya Akademi during 1986-88 is definitive evidence for the Akademi's commitment to the desirability and feasibility of the translation of literary works from one Indian language to another. The intensive drive to identify, bring together and provide training to practising and prospective translators in Indian languages has carried the message of national integration through literary translation to readers in different languages. I think we can now confidently claim that the participants at the different workshops listed in this report are activists engaged in the building up of our national literary consciousness. Apart from factual accounts of the programmes and proceedings of the four workshops, the present volume also contains the texts of select lectures delivered by visiting experts on various aspects of the translation of literature, historical surveys of translated literature in a few languages, discussions of the theoretical and practical problems of translation, views of eminent creative writers who have occasionally tried their hand at translation and the resolution and recommendations proposed by practising translators from all parts of India. To those interested in the functioning of the Sahitya Akademi, this book, it is hoped, will be a source of gratification; to the translator in the field confronted everyday with the insurmountable problems and difficulties of finding appropriate equivalents, it will be a source of inspiration and encouragement; and to the linguist and the scholar/critic, it will serve as an eye-opener, confirming certain of their insights but also challenging and modifying at least a few of their theoretical assumptions. I wish to place on record my gratitude to all those who have made the editing of this possible: especially to Professor Indra Nath Choudhuri for insisting that I should take up this work, to Mr K. Ramakrishnan for typing out the whole text running to hundreds of pages, and to Dr B. Chandrika, for help in collating and putting together the vast mass of material received from different centres. A four-week national workshop on literary translation was organised by the Sahitya Akademi with the express aim of bringing together translators from different parts of India and giving them a thorough grounding in the theoretical aspects of translation and the various issues and challenges that translators have to confront, especially in the multilingual Indian setting. 4. To introduce them to related disciplines, such as linguistics, semiotics and theories of literature. The second phase of the curriculum was aimed at moving from theory to practice. 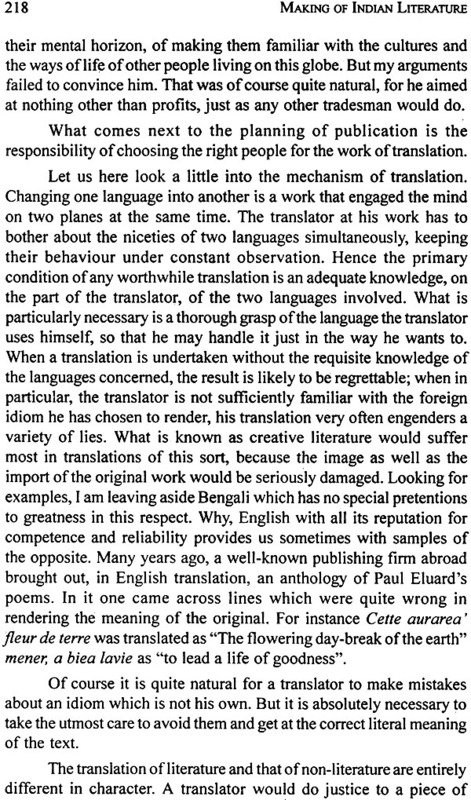 This was achieved by making close critical examinations of existing translations of well-known literary pieces in different languages. In the latter half of the second phase, participants were to translate given literary pieces from English into their respective languages and to evaluate the different translations made. The third phase was envisaged as a movement back from practice to theory by way of a reconsideration of the theoretical issues discussed in Phase I in the light of the translation experience gained during Phase II. It is a great paradox that though some consider the activity of translation to be "an impossible task," yet humans have been known to translate since ages. Moreover, translators - a rare breed of men of letters - have often been undervalued and have seldom been given the acclaim and commendation due to them. While original writers have earned all the glory, translators have often laboured in obscurity and have often remained unpraised, unsung and even unknown. And yet it is true that the activity of translation is almost as old as creative writing itself. Translations have always been done, though with different orientations, for different purposes .and to cater to different needs. Till as recently as the 1920's translation activity was more or less confined to literature, undertaken primarily for purposes of cross-cultural understanding. It came within the general ambit of comparative literature. Outside of literature, the only extension of translation activity was provided by the field of language teaching in which translation was considered, to be, at best, a tool. As a consequence of this delimitation, the clientele for translated texts was also limited to the cultivated elite. In more recent times, however, translation has become more of a social necessity and has begun to cater to the demands and needs, not only of the cultivated elite, but of the common man too. The world today is fast shrinking and coming closer through transport, satellite, new communication channels and international relations. No country, however isolated it may be, can afford to ignore the fact that at several levels - individual, societal and national - it has to depend on other nations. This interdependence, and the growing need for cross-cultural transfer, have brought translation to the very centre of communication. In order to cope with the explosion of knowledge, and to understand one another and to appreciate different modes of thought and different life-styles, translation is a vital, crucial activity. Ironically enough, the increase in communication and mobility (both horizontal and vertical) has brought in its wake great tensions and conflicts. Too often values have tended to become parochial and localised, leading to loss, or at least overshadowing, of that "unity in diversity" which has always characterised the Indian polity. This "unity in diversity", it must be remembered, refers not only to nationality but also to language, culture, social organisation and philosophy. This has given rise to the immediate need to look afresh at the very source of Indian unity - and Indian sensibility, an Indian ethos. It has also become imperative to see and understand how this sensibility and ethos is crafted into creative forms. Perhaps the main obstacle to the understanding and appreciation of this ethos and sensibility - the fountainhead of all creativity - is language. The multiplicity of language in our country has tended to erode "unity" and obscured the "oneness" of Indian sensibility and ethos. With the staggering figures of 1652 mother tongues, over 200 classified languages and ten different writing systems, we have tended to be confined within the narrow prison-house of one language or the other, and have lost sight of the oneness of Indian tradition, the commonality of our concerns and the common source of our creative ", endeavours. Translation, it would appear, is the only means of providing us a release from the narrow prison-house of different languages and • affording a fresh view of oneness, unity and commonality. All literature envisions and aspires to an "ideal": Indian literature too envisions and aspires to such an ideal. This "common ideal" must, of course, be the source of that nebulous "unity" we talk of. Literary translations into and from Indian languages can help us to unravel, capture and preserve this ideal. If translation has such a crucial role to play, not only in bringing closer the different languages and literatures of India, but also in capturing and promoting the common ideal and fountainhead of Indian creative writing, then translators from different language groups need to be brought together and made to interact. At the same time they need to be made aware of the special problems that literary translation entails. Translators (both practising and prospective translators) need. To sit in a conclave and consider the twin aspects of translation as "a product" and translation as "a process". The need is urgent and immediate.